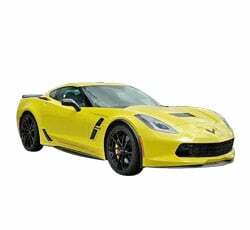 The 2019 Chevrolet Corvette is arguably the best sports car ever produced by an American automaker. It's sleek, lightning fast and reasonably priced. While even the base Corvette Stingray packs enough performance to keep a constant smile on your face, the new ZR1 is an absolute thrill machine. Supportive seats and decent highway fuel economy make the Corvette more than just a weekend toy. Let's find out why the Corvette continues to garner so many positive reviews. This year, Chevy has introduced the 755-horsepower ZR1 model. It's the most powerful trim in the lineup. Don't expect to see any exterior or interior changes on the 2019 Chevrolet Corvette. While several performance upgrades are available for the 2019 Chevrolet Corvette, you'll probably fall in love with the base Stingray model. When paired with the optional performance exhaust, its V-8 engine unleashes a tantalizing 460 horsepower. This car has the potential to clock a 0-60 time of 3.7 seconds. Rated to return up to 25 mpg, the Corvette is also efficient enough for cross-country road trips. You can get the 2019 Chevrolet Corvette with an eight-speed automatic gearbox. However, the standard seven-speed manual is a bit more fun. Even if you don't have much experience with changing gears, you'll quickly get the hang of the Corvette's manual transmission. Because the gearbox is so smooth, amateurs won't feel intimidated. Automatic rev-matching technology gives the transmission an extra fun factor. Some experts consider the 2019 Chevrolet Corvette Grand Sport to be the best model for the track. Although the Grand Sport version doesn't pack any extra power, it does come equipped with some great racing features. While an upgraded cooling system helps keep the engine from getting too hot, wider tires give the Corvette Grand Sport more grip around turns. Some of the other upgraded components include a Magnetic Ride Control system, a track-tuned suspension, and larger brakes. Sensational driving dynamics help the Corvette to rival sports cars that are in an entire different price bracket. You will love how quickly the Corvette can change directions. Even when sprinting around curves at a relatively quick pace, the 2019 Chevrolet Camaro sticks to the ground. Chevy tuned the suspension just right for daily driving. You won't experience a lot of bumpiness on the road. Stickier tires and a more aggressive suspension are optional. The 2019 Chevrolet Corvette has its own unique look. Longtime fans of the Corvette will definitely like the new model's flowing lines. Even the base Stingray model will be the center of attention. Signature LED headlights and a functional hood air extractor come standard. A quad-outlet adds to the Corvette's visual excitement. Several appearance upgrades are available, including a carbon fiber trim and special wheels. No one will ever confuse the 2019 Chevrolet Corvette with a family car. However, it offers more practicality than you make think. Supportive buckets seats help make the Corvette a good sports car for commuting. You can easily adjust the driver's seat to match your specific size. Although the Corvette is not a big car, most people won't feel confined. A usable trunk adds to the Corvette's practicality. There's enough space for golf bags and luggage. Although the 2019 Chevrolet Corvette is more expensive than a regular coupe, it’s a legitimate steal in the land of high-performance cars. Prices start at roughly $55,400, which is far more affordable than a new Porsche 911. The Corvette doesn’t even sacrifice a bit of performance. It also comes loaded with a surplus of great features. Some of the standard equipment includes a 4G Wi-Fi hot spot, a Bose premium sound system, and a touch-screen interface. The Corvette’s LT1 V8 engine enables it to produce an aggressive rumble. While the standard exhaust system is rather quiet, the optional performance exhaust truly sounds phenomenal. It makes driving the 2019 Chevrolet Corvette even more exciting. However, you can quiet the exhaust at the touch of a button. Special valve flaps dramatically lower the volume. When you leave home, you’ll never have to worry about annoying your neighbors. If you simply want bragging rights, consider the new ZR1 model. Its supercharged engine kicks out a monumental 755 horsepower. Because the engine has so much torque, you’ll have gobs of power even at low speeds. A 0-60 time of 2.85 seconds puts the Corvette ZR1 among the world’s elite. This model also looks seriously aggressive. If you’re like a lot of other driving enthusiasts, you want to monitor your performance on the track. Chevy’s Performance Data Recorder makes it easy for you to do so. Not only can the system log important data such as g-force and speed, but it can also provide video footage of your entire track experience. A high-definition camera records from the driver’s point of view. Despite being a great value, the 2019 Chevrolet Corvette may still be out of your league. It costs more money than most people can fork out. The upper trims could definitely put a strain on your finances. While the Z06 model starts at nearly $80,000, the mighty ZR1 model can easily approach $120,000. If cost is an issue, consider getting the less expensive Chevrolet Camaro. The new Corvette is strictly a car for two passengers. You will not have access to a backseat. This could be an issue for the parents who must think about their children. Your friends will also be unable to join the fun. The 2019 BMW M4’s backseat will allow you to squeeze in a couple more passengers. Like most high-powered cars, the Corvette isn’t focused on saving fuel. Although its 25-mpg highway rating isn’t bad, some drivers will still desire more efficiency. This is especially true for the folks who like to travel. The entry-level Porsche 911 and the new Jaguar F-Type can actually deliver up to 30 mpg. Most people consider the new Corvette to be a head-turner. While its sleek design will appeal to a lot of sports cars fanatics, others will find it to be too aggressive. It’s unknown whether the Corvette’s extroverted styling will age gracefully over the years. Some drivers will also miss the old Corvette’s classic round taillights. The Corvette is a true driver’s car. Aside from an advanced stability control system, it does not come equipped with any other driving aids. This means you won’t be able to get safety innovations like blind-spot detection and forward collision alert. You can compare the 2019 Chevrolet Corvette to the 2019 Porsche 718 Cayman. These two sports cars have a similar starting price. However, you’ll find more standard features inside the new Corvette. You should also look at the 2019 Jaguar F-Type. While the Jaguar F-Type is an entertaining sports car, it does not provide as much trunk space. The Chevrolet Camaro is a good alternative to the Corvette. A lower price tag gives it a big advantage. While the Camaro is definitely a fun performance car, it’s not as upscale as the Corvette. If you are seeking a premium sports car, the new Chevrolet Corvette is more than deserving of a test drive. Its electrifying performance is bound to activate your adrenaline glands. Even if you settle for the base Stingray model, you’ll still be very pleased. A spacious trunk is another one of the Corvette's great qualities. While this American sports car continues to impress, there are some drawbacks to keep in mind. Aside from not offering any advanced safety technologies, the Corvette is a terrible performer in the snow.